Theo James as Michael (left) and Writer/Director Per Fly (right). Photo courtesy of A24. Back in 2012, Danish writer/director Per Fly (Drabet, The Inheritance) was introduced to Michael Soussan’s memoir Backstabbing for Beginners: My Crash Course in International Diplomacy. The book is based on the true story of Michael Soussan, a former U.N. member and a first-hand witness to the 2002-2003 Oil-for-Food Program (OIP) scandal, within the United Nations. The OIP was specifically designed to feed hungry children in the Middle East. The scandal became a world-wide conspiracy, in which numerous United Nations officials accepted bribes and kickbacks from Saddam Hussein’s government. Writer/Director Per Fly (left) and Theo James as Michael (right). Photo courtesy of A24. Initially, the book was pitched as a documentary. However, Fly envisioned the final product more of a fiction film about a young man in a situational dilemma, about the grey area of politics and the innumerable forms of truth, rather than a political talking heads documentary. The director collaborated with screenwriter Daniel Pyne (The Manchurian Candidate, The Sum of All Fears) and penned the screenplay based on real life events. The Danish filmmaker initiated his in-depth research by visiting the author and source of origin in New York. Fly sat with the former U.N. associate for two days and asked about his experiences along with the effects on him emotionally. Soussan revealed important additional nuances which weren’t cited in the book, such as psychological happenings in several situations. Theo James as Michael (left) and Ben Kingsley as Pasha (right). Photo courtesy of A24. An underlying theme is the correlation between Michael and Pasha, which resembles a father/son relationship. “When you’re a small child, you believe in everything your father says. When you grow up, you challenge his wisdom; but he will be too clever for you. If he’s not a good father, he’s a little bit like a villain father, then you start finding out his way of thinking doesn’t work. Maybe I have to go against him and that happens a lot in father/son films. In the Freudian way, you have to conquer your father to become yourself,” continued the director. “We are telling a story around 2002 about the invasion in 2003. It is the beginning of the whole mess in the world we see today. We have to keep on hoping the truth will come out and therefore we have to praise our whistleblowers. People are taking very high risks to tell the truth,” Fly concluded. 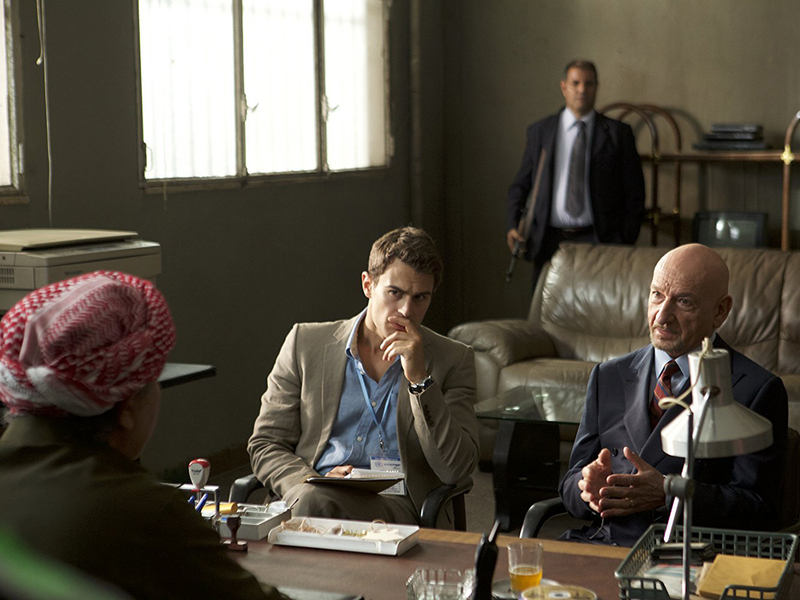 To witness the true events in the biggest humanitarian program in U.N. history, known as the Oil-for-Food Scandal; Backstabbing for Beginners is in theaters on April 27, 2018.